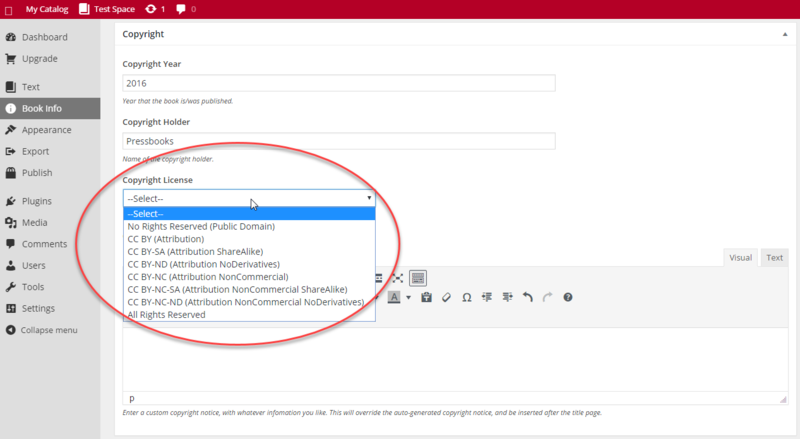 Pressbooks enables you to automatically display a Creative Commons license in your outputs. You can go to the Book Info page and select the appropriate license from the “Copyright License” dropdown menu. This will add the CC logo and brief explanation of the license conditions to the copyright page in your PDF and ebooks, and to the landing page of your webbook. For more on Creative Commons licenses, see their website. You can read about chapter-level copyright licenses and more in the Copyright chapter.